Abstract: Long-acting muscarinic antagonist (LAMA) or long-acting β2-agonist (LABA) bronchodilators and their combination are recommended for the maintenance treatment of chronic obstructive pulmonary disease (COPD). Although the efficacy of LAMAs and LABAs has been well established through randomized controlled trials (RCTs), questions remain regarding their cardiovascular (CV) safety. Furthermore, while the safety of LAMA and LABA monotherapy has been extensively studied, data are lacking for LAMA/LABA combination therapy, and the majority of the studies that have reported on the CV safety of LAMA/LABA combination therapy were not specifically designed to assess this. Evaluation of CV safety for COPD treatments is important because many patients with COPD have underlying CV comorbidities. However, severe CV and other comorbidities are often exclusion criteria for RCTs, contributing to a lack in external validity and generalizability. Real-world observational studies are another important tool to evaluate the effectiveness and safety of COPD therapies in a broader population of patients and can improve upon the external validity limitations of RCTs. We examine what is already known regarding the CV and cerebrovascular safety of LAMA/LABA combination therapy from RCTs and real-world observational studies, and explore the advantages and limitations of data derived from each study type. We also describe an ongoing prospective, observational, comparative post-authorization safety study of a LAMA/LABA combination therapy (umeclidinium/vilanterol) and LAMA monotherapy (umeclidinium) versus tiotropium, with a focus on the relative merits of the study design. Due to their mechanisms of action, both LAMAs and LABAs have the potential to cause cardiac-related adverse events (AEs). LAMAs suppress parasympathetic control of heart rate (HR) and LABAs stimulate sympathetic control of HR. These effects serve to raise HR with the potential to cause cardiac arrhythmias, myocardial infarction (MI), stroke, and sudden death in susceptible patients.1,12–15 When administered as combination therapy, LAMAs and LABAs are often combined using the same doses as for monotherapy. Thus, hypothetically, an increase in cardiovascular (CV) AEs compared with monotherapy cannot be excluded. Randomized controlled trials (RCTs) are considered the gold standard study design for gaining evidence for regulatory approval. Real-world observational studies are often non-interventional in nature and may be prospective or retrospective in design. They are conducted in wider patient populations who have a range of demographics and characteristics and are important for monitoring the effects of therapies outside of the controlled setting. 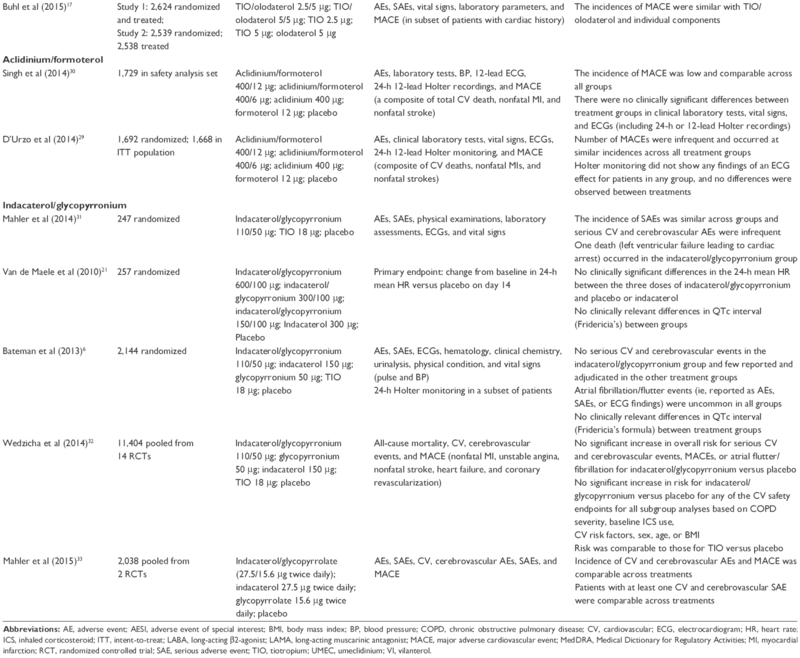 This is particularly important in COPD, where CV comorbidities are prevalent,16 but are frequently an exclusion criterion for participation in RCTs,17–20 an issue that has been coined the “COPD trial paradox”.12 Here, we review the available evidence from RCTs and real-world observational studies regarding the CV and cerebrovascular safety of LAMA/LABA combination therapy versus monotherapy in COPD. We also include a special focus on an ongoing prospective, observational, comparative post-authorization safety (PAS) study of the LAMA/LABA combination therapy, umeclidinium (UMEC)/vilanterol (VI), or UMEC monotherapy versus the LAMA monotherapy, tiotropium (TIO). Abbreviations: AE, adverse event; AESI, adverse event of special interest; BMI, body mass index; BP, blood pressure; COPD, chronic obstructive pulmonary disease; CV, cardiovascular; ECG, electrocardiogram; HR, heart rate; ICS, inhaled corticosteroid; ITT, intent-to-treat; LABA, long-acting β2-agonist; LAMA, long-acting muscarinic antagonist; MACE, major adverse cardiovascular event; MedDRA, Medical Dictionary for Regulatory Activities; MI, myocardial infarction; RCT, randomized controlled trial; SAE, serious adverse event; TIO, tiotropium; UMEC, umeclidinium; VI, vilanterol. More recently, Kruis et al45 evaluated the external validity of six large industry-sponsored COPD trials (ISOLDE, TRISTAN, TORCH, UPLIFT, ECLIPSE, and POET-COPD), on which current COPD treatment guidelines are largely based. Compared with data from seven large European primary care databases, the population included in these RCTs was younger, predominantly male, with worse lung function and poorer quality of life. There was also a large difference in the disease severity (GOLD) distribution of patients enrolled in the RCTs versus the primary care database. For example, no patients with COPD with mild severity (GOLD I) were included in the RCTs, while patients with severe COPD (GOLD III) were overrepresented in the industry-sponsored studies versus the primary care population (44.5% vs 21%, respectively). Furthermore, baseline data on exacerbations suggested overrepresentation of patients with prior exacerbations in the RCTs compared with the primary care population. Overall, it was shown that the proportion of patients from the primary care population that would be eligible to be included in the industry-sponsored RCTs ranged from 17% (TRISTAN) to 42% (ECLIPSE and UPLIFT). Data from real-world observational studies reporting on LAMA/LABA combination therapy in COPD are currently lacking. Recently, a real-world study of patients included in the Registre de Données en Santé Pulmonaire database, which records information on Canadian patients with asthma or COPD, compared AEs associated with LAMA or LABA monotherapy use and LAMA/LABA combination use in patients with COPD. However, the study did not specifically report on CV and cerebrovascular AEs.48 Indeed, to date, we are not aware of any real-world observational studies that have specifically assessed the CV and cerebrovascular risk of LAMA/LABA combination therapy in COPD. Real-world observational studies are designed to more closely reflect routine clinical practice and thus do not exclude patients with comorbidities associated with COPD or have further limitations with inclusion criteria such as upper age limit or smoking history. In contrast to RCTs, observational studies include a wider selection of patients and focus on balancing the risks and benefits of treatments.37 In contrast to the internal validity achieved in RCTs, the main advantage of real-world observational studies is their higher external validity, generally enrolling a wide range of patients across different treatment settings.34,37 Real-world data from observational studies can also provide evidence of effectiveness to support health care decisions49 and assist health care policy makers in dealing with coverage and reimbursement decisions when evaluating the cost effectiveness of a treatment.50,51 Real-world observational studies also ensure that drug safety is monitored in a broad population of patients. Prospective non-interventional studies, such as DACCORD registry, or the open-label pragmatic trial called the Salford Lung Study are examples of large observational COPD studies generating real-world evidence.49,52 DACCORD is an ongoing 2- to 4-year real-world study being conducted in over 6,000 patients in ~500 primary and secondary care practices in Germany. Patients fall into two groups, one treated according to standard of care with a glycopyrronium-containing regimen and another group treated according to standard of care without glycopyrronium. The study focuses on patient-related outcomes, time to first exacerbation, frequency of exacerbations, and lung function variables. The main strengths of the DACCORD study are the large size of study population, the long-term follow-up period, the broad inclusion criteria, and the implementation of disease management program criteria, which aims to ensure that only patients with appropriate COPD diagnosis are enrolled.52 The Salford Lung Study consists of two open-label Phase III pragmatic RCTs in asthma and COPD. It was designed to compare the real-world effectiveness of fluticasone furoate/VI via inhaler (plus standard care) versus regular maintenance therapy (plus standard care) for COPD and asthma in routine primary care. Following randomization, patients receive standard care by their physician for 12 months and effectiveness and safety data were collected using electronic health records. The design strengths of the Salford Lung Study are that it is a large, prospective, randomized study with broad inclusion criteria, which allow it to bridge the gap between low external validity RCTs and low internal validity non-randomized observational studies.49,53 One potential limitation of the study is the relatively high level of intervention required by regulatory authorities due to the randomized nature of the trial, as this undermines the real-world design of the study, impacting on the Hawthorne effect. There are a few studies with large patient populations that have specifically assessed the CV and cerebrovascular safety of LAMAs and LABAs, such as SUMMIT, TORCH, UPLIFT, and TIOSPIR.36,55–57 However, much of the available data assessing CV and cerebrovascular risk have come from non-prespecified AE analyses in RCTs, which may not have been powered for CV AEs. The 201038 PAS study is a prospective real-world observational cohort study that aims to reflect the real-world experience of patients with COPD treated with UMEC/VI or UMEC in the post-approval setting. The primary objectives of the study are to demonstrate the non-inferiority of UMEC/VI and UMEC alone versus TIO for the risks of MI, stroke, or heart failure, each based on an analysis of time to first event. The study will also quantify the incidence rate and frequency of MI, stroke, and heart failure for new users of UMEC/VI, UMEC, and TIO. The primary and secondary safety outcomes are presented in Table 2. Notes: aPer person year; bincluding transient ischemic attacks, angina, cardiac arrhythmias, acquired long-QT interval, cardiac ischemia and hypertension; Caccording to MedDRA SOC and PT; All treatment comparisons of primary and secondary safety outcomes will be analyzed using hazard ratios for time to first event. Abbreviations: AE, adverse event; CV, cardiovascular; LRTI, lower respiratory tract infection; MedDRA, medical dictionary for regulatory activities; MI, myocardial infarction; PT, preferred term; SAE, serious adverse event; SOC, system organ class; UMEC, umeclidinium; VI, vilanterol. This study is a non-randomized, observational study being carried out in several European Union (EU) and non-EU countries that have UMEC/VI, UMEC, and TIO available on prescription. Patients are enrolled in the study at the time of receiving a new prescription for UMEC/VI, UMEC, or TIO. The decision to initiate treatment with UMEC/VI, UMEC, or TIO is made independently by the patient and their physician and is not mandated by the study design or protocol. All patients are followed from initiation of treatment until the required number of CV events has been observed in the study population. All patients are observed over a minimum of 24 months, or until withdrawal of consent, loss to follow-up, or death (Figure 1). The estimated maximum duration of follow-up is between 2 and 5 years. Data on patients are collected at routine visits at least twice yearly, as well as at unscheduled visits as per normal standard of care. All data will be collected via electronic case report forms (eCRFs) from information routinely recorded in patient’s medical records or through patient self-report. Hospital discharge summaries will be requested by the investigator or site staff for all hospitalizations of enrolled patients. Data from these summaries will be captured on the eCRF and also used for adjudication of CV and cerebrovascular events. Written, informed consent was and will be obtained from all patients who participate in the study. The study was approved by Sächsische Landesärztekammer, Dresden, Germany and other relevant national, regional, or investigational center Ethics Committee/Institutional Review Boards, and is and will be performed in accordance with the International Conference on Harmonisation of Technical Requirements for Registration of Pharmaceuticals for Human Use Good Clinical Practice (ICH-GCP) guidelines and all applicable patient privacy requirements and the ethical principles outlined in the Declaration of Helsinki, 2013. Figure 1 Study design for the new 201038 Post-authorization Safety Study of UMEC/VI combination therapy. Note: *The follow-up period will be defined as the period between the prescription index date until the earliest of: date when the planned number of events has been reached, 14 days following date of discontinuation of initiated COPD medication, withdrawal from the study, conclusion of study follow-up or death. Abbreviations: COPD, chronic obstructive pulmonary disease; HCP, health care practitioner; TIO, tiotropium; VI, vilanterol; UMEC, umeclidinium. The study is enrolling ~7,800 patients from 700 study centers in selected EU member states and other non-EU countries where UMEC/VI, UMEC, and TIO are available on prescription. Enrollment in non-EU countries is capped at ~50%. Eligible patients are enrolled by primary care physicians and pulmonologists and are aged ≥18 years, with a clinical diagnosis of COPD verified by spirometry (defined as a post-bronchodilator FEV1/forced vital capacity ratio of <0.7) and initiating treatment with either UMEC/VI, UMEC, or TIO. Key exclusion criteria include current participation in any interventional clinical trials; hypersensitivity to UMEC, VI, TIO, or excipients; and maintenance treatment (defined as ≥60 days of continuous use) with a LAMA-containing medication during the 12 months prior to enrollment. At enrollment, detailed data on patient demographics, baseline characteristics, modified Medical Research Council and COPD assessment test questionnaire scores, disease comorbidities, and concomitant medication use are collected using an eCRF. Information is provided by the treating physician based on a combination of self-reported information from the enrolled patient and where available, supplemented by the patient’s electronic medical records. The study is event-driven, requiring at least 98 events for each of MI, stroke, and heart failure for each pair of treatments (UMEC/VI vs TIO; UMEC vs TIO). Therefore, the number of patients that need to be enrolled will be updated as necessary throughout the study. The study has a 90% power to reject a non-inferiority margin of a hazard ratio of 2.0 for each treatment pair for each outcome (MI, stroke, and heart failure). This is based on the requirement that the 95% confidence interval for the hazard ratio excludes 2.0. The study incorporates several important design features that aim to minimize the potential limitations of observational studies, such as potential confounding by indication bias or attrition bias, and the lack of blinding. Observational studies are often retrospective; however, enrollment in this study is prospective, allowing for robust data collection through eCRFs. The study aims to recruit a wide population of patients with COPD from different care settings. Eligible patients are enrolled by both primary care physicians and pulmonologists, which helps to ensure representation from different care settings. Patients “new” to therapy are defined as not having received LAMA maintenance therapy for ≥60 consecutive days during the previous 12 months. This should minimize enrolled patient “survival” bias, where prevalent users of LAMAs that have survived are disproportionately represented in any treatment groups.58 This is particularly important for assessing whether mortality risk is affected by treatment. Specifically, it minimizes the bias of prescription of two LAMAs (eg, UMEC/VI added to TIO), which may unfortunately occur in error. However, this is also a potential limitation of the study as it excludes many patients, particularly as LAMA maintenance is the most frequently prescribed treatment for COPD in some countries, such as Germany.59 The requirement that patients must not have received LAMA maintenance therapy for ≥60 consecutive days during the prior 12 months also limits the patients included, meaning that the enrolled population will not be fully representative of the wider COPD patient population. However, patients can continue on existing maintenance treatments, which helps to reduce the potential for excluding patients with more severe disease. Also the factors that may be associated with treatment choice (and with risk of primary events) are documented to account for potential confounding in propensity score analyses. Additionally, as follow-up does not require patients to return to their study center except for routine care, follow-up bias whereby patients with AEs are more or less likely to return to see their study physician is minimized by maintaining a low lost to follow-up rate (a rate of <5% is anticipated). Furthermore, to standardize the reporting of primary CV events (MI, stroke, or heart failure) between centers (which may adopt different interpretations and event definitions), only events confirmed by the blinded adjudication committee are included. The expected event rates for MI, stroke, and heart failure are 98, 108, and 168,60 although as the study is event-driven, recruitment rates will be adjusted once the actual event rate in this population is known. Both RCTs and real-world observational studies contribute important data regarding the efficacy, safety, and effectiveness of COPD treatments. When evaluating a treatment effect it is important for health care practitioners to consider the generalizability of study findings to their patients. As both study types have inherent limitations, data from the pivotal COPD RCTs are complemented by real-world observational study data, which should both be evaluated to elucidate evidence of any treatment benefits and safety concerns. More research is needed to determine the effects of COPD treatments in patients who have been underrepresented in RCTs, such as women and patients with mild and very severe disease. Furthermore, the CV safety of COPD treatments in real-life patients, including those with comorbidities, should be further investigated, both in observational studies and more inclusive pragmatic RCTs. As there is hypothetically a potential for higher CV risk with dual bronchodilator treatment, the new 201038 PAS study documented here will provide data on the CV and cerebrovascular risks of the LAMA/LABA combination UMEC/VI, and the LAMA monotherapies UMEC and TIO in a real-world setting. The study design aims to reduce some of the common limitations of observational studies and to provide safety data for dual bronchodilator therapy in a more vulnerable COPD population than those included in RCTs. The authors would like to thank the members of the 201038 Post-authorisation Safety Study (PAS) Steering Scientific Committee for their contribution to the study design. They would also like to thank Alex Lowe, PhD, from Fishawack Indicia Ltd, who provided editorial assistance with developing this manuscript (in the form of writing assistance, including development of the initial draft, assembling tables and figures, collating authors comments, grammatical editing, and referencing), funded by GSK. This study was funded by GSK (GSK study: 201038). PK, SW, DS, MR-R, HM, and DEN contributed to the study concept and design. All authors were involved in the preparation and review of the manuscript, approved the final version submitted and agree to be accountable for all aspects of the work. DEN has received sponsorship to attend international meetings, honoraria for lecturing or attending advisory boards and research grants from various pharmaceutical companies including AstraZeneca, BMS, Boehringer Ingelheim, GSK, Novartis, and Pfizer. DS has received sponsorship to attend international meetings, honoraria for lecturing or attending advisory boards and research grants from various pharmaceutical companies including Almirall, AstraZeneca, Boehringer Ingelheim, Chiesi, Genentech, GSK, Glenmark, Johnson & Johnson, Merck, NAPP, Novartis, Pfizer, Skyepharma, Takeda, Teva, Theravance, and Verona. MR-R has received sponsorship to attend international meetings, honoraria for lecturing or attending advisory boards and research grants from various pharmaceutical companies including Almirall, AstraZeneca, Boehringer Ingelheim, Chiesi, GSK, Mundipharma, Novartis, Pfizer, ROVI, and Teva. PK received honoraria for lecturing and advisory boards from the following pharmaceutical companies: AstraZeneca, Boehringer Ingelheim, Chiesi, Menarini, Mundipharma, Novartis, Roche, Takeda, and Teva; and sponsorship for German national and international conferences from AstraZeneca, Boehringer Ingelheim, Menarini, and Novartis. SW and HM are employees of GSK and hold stocks/shares in GSK. GOLD. Global strategy for the diagnosis, management and prevention of chronic obstructive pulmonary disease. Available from: http://www.goldcopd.com/. Accessed August 12, 2015.
WHO. Chronic Obstructive Pulmonary Disease. Available from: http://www.who.int/mediacentre/factsheets/fs315/en/. Accessed November, 2015. Barr RG, Bourbeau J, Camargo CA, Ram FS. Inhaled tiotropium for stable chronic obstructive pulmonary disease. Cochrane Database Syst Rev. 2005(2):CD002876. Decramer M, Anzueto A, Kerwin E, et al. Efficacy and safety of umeclidinium plus vilanterol versus tiotropium, vilanterol, or umeclidinium monotherapies over 24 weeks in patients with chronic obstructive pulmonary disease: results from two multicentre, blinded, randomised controlled trials. Lancet Respir Med. 2014;2(6):472–486. Donohue JF, Niewoehner D, Brooks J, O’Dell D, Church A. Safety and tolerability of once-daily umeclidinium/vilanterol 125/25 mcg and umeclidinium 125 mcg in patients with chronic obstructive pulmonary disease: results from a 52-week, randomized, double-blind, placebo-controlled study. Respir Res. 2014;15:78. Farne HA, Cates CJ. Long-acting beta2-agonist in addition to tiotropium versus either tiotropium or long-acting beta2-agonist alone for chronic obstructive pulmonary disease. Cochrane Database Syst Rev. 2015;10:CD008989. 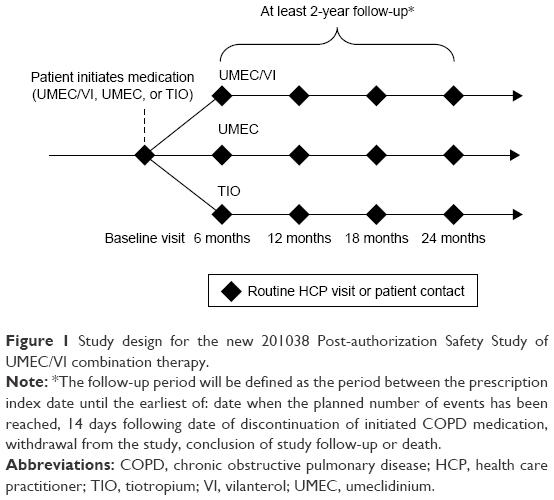 Maleki-Yazdi MR, Kaelin T, Richard N, Zvarich M, Church A. Efficacy and safety of umeclidinium/vilanterol 62.5/25 mcg and tiotropium 18 mcg in chronic obstructive pulmonary disease: results of a 24-week, randomized, controlled trial. Respir Med. 2014;108(12):1752–1760. Wedzicha JA, Banerji D, Chapman KR, et al. Indacaterol-Glycopyrronium versus Salmeterol-Fluticasone for COPD. N Engl J Med. 2016;374(23):2222–2234. Lahousse L, Verhamme KM, Stricker BH, Brusselle GG. Cardiac effects of current treatments of chronic obstructive pulmonary disease. Lancet Respir Med. 2016;4(2):149–164. Gershon A, Croxford R, Calzavara A, et al. Cardiovascular safety of inhaled long-acting bronchodilators in individuals with chronic obstructive pulmonary disease. JAMA Intern Med. 2013;173(13):1175–1185. Salpeter SR, Ormiston TM, Salpeter EE. Cardiovascular effects of beta-agonists in patients with asthma and COPD: a meta-analysis. Chest. 2004;125(6):2309–2321. Singh S, Loke YK, Enright P, Furberg CD. Pro-arrhythmic and pro-ischaemic effects of inhaled anticholinergic medications. Thorax. 2013;68(1):114–116. Chapman KR, Beeh KM, Beier J, et al. A blinded evaluation of the efficacy and safety of glycopyrronium, a once-daily long-acting muscarinic antagonist, versus tiotropium, in patients with COPD: the GLOW5 study. BMC Pulm Med. 2014;14:4. Fukuchi Y, Samoro R, Fassakhov R, et al. Budesonide/formoterol via Turbuhaler® versus formoterol via Turbuhaler® in patients with moderate to severe chronic obstructive pulmonary disease: phase III multinational study results. Respirology. 2013;18(5):866–873. Gelb AF, Tashkin DP, Make BJ, Zhong X, Garcia Gil E, Caracta C; LAS-MD-35 study investigators. Long-term safety and efficacy of twice-daily aclidinium bromide in patients with COPD. Respir Med. 2013;107(12):1957–1965. Van de Maele B, Fabbri LM, Martin C, Horton R, Dolker M, Overend T. Cardiovascular safety of QVA149, a combination of Indacaterol and NVA237, in COPD patients. COPD. 2010;7(6):418–427. Hu C, Jia J, Dong K, et al. 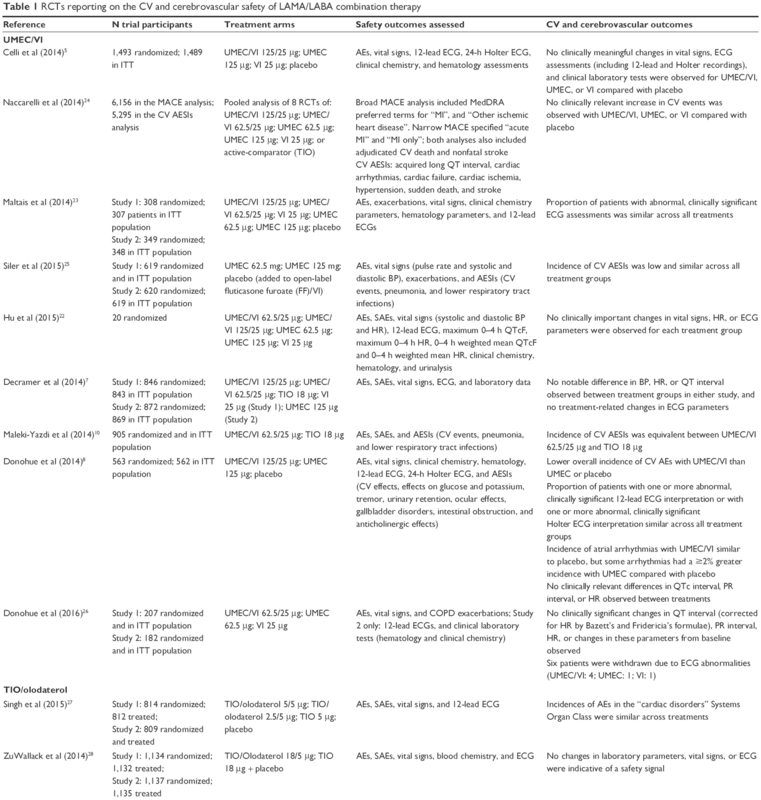 Pharmacokinetics and tolerability of inhaled umeclidinium and vilanterol alone and in combination in healthy Chinese subjects: a randomized, open-label, crossover trial. PLoS One. 2015;10(3):e0121264. Naccarelli G, Finkle J, Chopra B, Brooks J, Harris S, Chruch A. Cardiovascular safety of Umeclidinium/Vilanterol in COPD: Results from eight randomized clinical trials. Presented at: San Diego, California: ATS Conference; May 16–21;2014. Siler TM, Kerwin E, Sousa AR, Donald A, Ali R, Church A. Efficacy and safety of umeclidinium added to fluticasone furoate/vilanterol in chronic obstructive pulmonary disease: Results of two randomized studies. Respir Med. 2015;109(9):1155–1163. Donohue JF, Singh D, Munzu C, Kilbride S, Church A. Magnitude of umeclidinium/vilanterol lung function effect depends on monotherapy responses: Results from two randomised controlled trials. Respir Med. 2016;112:65–74. ZuWallack R, Allen L, Hernandez G, Ting N, Abrahams R. Efficacy and safety of combining olodaterol Respimat(®) and tiotropium HandiHaler(®) in patients with COPD: results of two randomized, double-blind, active-controlled studies. Int J Chron Obstruct Pulmon Dis. 2014;9:1133–1144. Mahler DA, Decramer M, D’Urzo A, et al. Dual bronchodilation with QVA149 reduces patient-reported dyspnoea in COPD: the BLAZE study. Eur Respir J. 2014;43(6):1599–1609. Wedzicha JA, Dahl R, Buhl R, et al. Pooled safety analysis of the fixed-dose combination of indacaterol and glycopyrronium (QVA149), its monocomponents, and tiotropium versus placebo in COPD patients. Respir Med. 2014;108(10):1498–1507. Mahler DA, Kerwin E, Ayers T, et al. FLIGHT1 and FLIGHT2: Efficacy and safety of QVA149 (Indacaterol/glycopyrrolate) versus its monocomponents and placebo in patients with chronic obstructive pulmonary disease. Am J Respir Crit Care Med. 2015;192(9):1068–1079. Bartlett SJ, Barnes T, McIvor RA. Integrating patients into meaningful real-world research. Ann Am Thorac Soc. 2014;11(Suppl 2):S112–S117. Wise RA, Anzueto A, Cotton D, et al. Tiotropium Respimat inhaler and the risk of death in COPD. N Engl J Med. 2013;369(16):1491–1501. Freemantle N, Strack T. Real-world effectiveness of new medicines should be evaluated by appropriately designed clinical trials. J Clin Epidemiol. 2010;63(10):1053–1058. Halpin DM. Lessons from the major studies in COPD: problems and pitfalls in translating research evidence into practice. Prim Care Respir J. 2010;19(2):170–179. Albert RK. “Lies, damned lies …” and observational studies in comparative effectiveness research. Am J Respir Crit Care Med. 2013;187(11):1173–1177. Carolan BJ, Sutherland ER. Clinical phenotypes of chronic obstructive pulmonary disease and asthma: recent advances. J Allergy Clin Immunol. 2013;131(3):627–634; quiz 635. Herland K, Akselsen JP, Skjonsberg OH, Bjermer L. How representative are clinical study patients with asthma or COPD for a larger “real life” population of patients with obstructive lung disease? Respir Med. 2005;99(1):11–19. Scichilone N, Basile M, Battaglia S, Bellia V. What proportion of chronic obstructive pulmonary disease outpatients is eligible for inclusion in randomized clinical trials? Respiration. 2014;87(1):11–17. Kruis AL, Stallberg B, Jones RC, et al. Primary care COPD patients compared with large pharmaceutically-sponsored COPD studies: an UNLOCK validation study. PLoS One. 2014;9(3):e90145. Travers J, Marsh S, Caldwell B, et al. External validity of randomized controlled trials in COPD. Respir Med. 2007;101(6):1313–1320. Society ER. The European Lung White Book: Respiratory Health and Disease in Europe. 2nd ed. Sheffield, UK: European Respiratory Society; 2013. Rodrigue C, Beauchesne MF, Savaria F, et al. Adverse events among COPD patients treated with long-acting anticholinergics and beta2-agonists in an outpatient respiratory clinic. Respir Med. 2016;113:65–73. New JP, Bakerly ND, Leather D, Woodcock A. Obtaining real-world evidence: the Salford Lung Study. Thorax. 2014;69(12):1152–1154. Garrison LP Jr, Neumann PJ, Erickson P, Marshall D, Mullins CD. Using real-world data for coverage and payment decisions: the ISPOR Real-World Data Task Force report. Value Health. 2007;10(5):326–335. van Boven JF, Roman-Rodriguez M, Kocks JW, Soriano JB, Postma MJ, van der Molen T. Predictors of cost-effectiveness of selected COPD treatments in primary care: UNLOCK study protocol. NPJ Prim Care Respir Med. 2015;25:15051. Kardos P, Vogelmeier C, Buhl R, Criee CP, Worth H. The prospective non-interventional DACCORD study in the national COPD registry in Germany: design and methods. BMC Pulm Med. 2015;15:2. Bakerly ND, Woodcock A, New JP, et al. The Salford Lung Study protocol: a pragmatic, randomised phase III real-world effectiveness trial in chronic obstructive pulmonary disease. Respir Res. 2015;16:101. Kardos P, Buhl R, Criée C-P, Vogelmeier C, Mailaender C, Worth H. P46 Frequency of COPD exacerbations in the German DACCORD Registry. Thorax. 2015;70:A98–A99. Tashkin DP, Leimer I, Metzdorf N, Decramer M. Cardiac safety of tiotropium in patients with cardiac events: a retrospective analysis of the UPLIFT® trial. Respir Res. 2015;16:65. Vestbo J, Anderson J, Brook RD, et al. The study to understand mortality and morbidity in COPD (SUMMIT) study protocol. Eur Respir J. 2013;41(5):1017–1022. Ray WA. Evaluating medication effects outside of clinical trials: new-user designs. Am J Epidemiol. 2003;158(9):915–920. Worth H, Buhl R, Criee CP, Kardos P, Mailander C, Vogelmeier C. The ‘real-life’ COPD patient in Germany: the DACCORD study. Respir Med. 2016;111:64–71. Jara M, Wentworth C 3rd, Lanes S. A new user cohort study comparing the safety of long-acting inhaled bronchodilators in COPD. BMJ Open. 2012;2(3):pii:e000841.